Sited in the Almora district of Uttarakhand, Ranikhet is the abode to Kumaon Regiment and spiked with good conventional military environment, it spreads over undulating verdant hills with several exquisite views of the far-away Himalaya. The hub of the town is a full of activity bazaar area, however you do not have to stride far along the snaking Mall Road to be engrossed in woodland and soaring English trees. Considered as one of the most beautiful hill stations of India, it literally means the “Queen's meadow”. It is the beauty and incomparable charm of this place which attracts thousands of visitors every year, leaving them spellbound with its sheer exquisiteness. For nature enthusiasts this place has many things to offer, as one can see the beauty of nature at its fullest here. The chirping of birds, the pied noises and aroma of the regional plants, make this place a charismatic destination for visitors. Natural rambles, astounding views of snow covered pinnacles including Nanda Devi Peak, proffer a pleasant experience to the tourists. The region, affluent with pine, oak, and deodar forests, is a major draw. Ranikhet is also an exhilarating trekking destination. One can trek up to Gages and Dwarahat from Ranikhet. Military Museum is one of the major attractions. 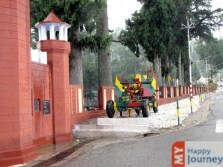 Visit the military museum, enjoy serene walks or relish the sights of snow filled peaks, there is a lot of things to do in Ranikhet – it is surely a fun retreat away from the hustles and bustles of daily life.